St Dunstan, one of the most important Anglo-Saxon saints, was archbishop of Canterbury (961-988), but also had been abbot of Glastonbury and bishop of Worcester and London. He started his career as a hermit at Glastonbury, where he lived in a hut, studied, made religious objects and played the harp. Well-connected, he came to control large amounts of money and property, which he used to further the reform of the church. 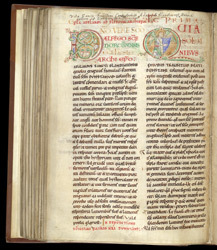 His 'Life' was written by a monk of Bath, Adalard, for archbishop Alfege, as the inscription and title in red (rubric) at the top of the page inform the reader. His 'Life' begins with a decorated letter bearing a picture of an angel playing a harp--a reference to stories of his days at Glastonbury.